I’m not sure what it is, but ever since my boys have been helping out in the vineyard, they are craving all sorts of foods in different combinations. It must be all the fresh air and hard work! When my older son saw this on the cover of a magazine, he insisted I make it for him. He does love tacos and burgers and was intrigued with what this combination would taste like. He loved it and it was exactly what he expected. I would also agree this was very good and definitely puts a twist on grilling night. I especially liked the crunchy chips and sour cream with the salsa. Try this out let me know what you think. Start by making your favorite burger, I use ground chuck and some salt to make my patties. Sprinkle each patty with some cumin, oregano and chile power before grilling. 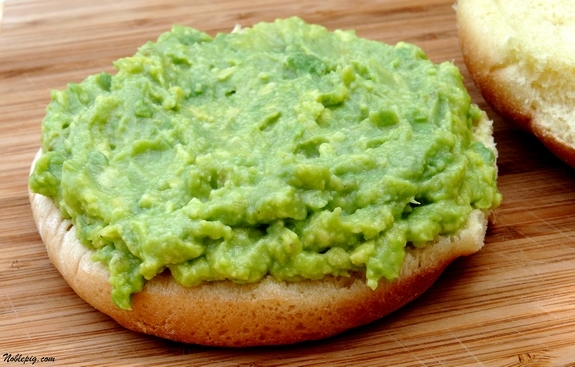 Place guacamole on the bottom half of a hamburger bun. 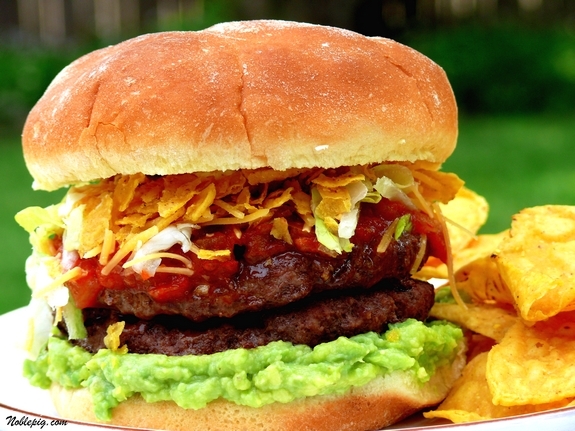 Place grilled burgers on top of the guacamole and top with salsa, lettuce, cheddar, sour cream and tortilla chips. Place guacamole on the bottom half of a hamburger bun. 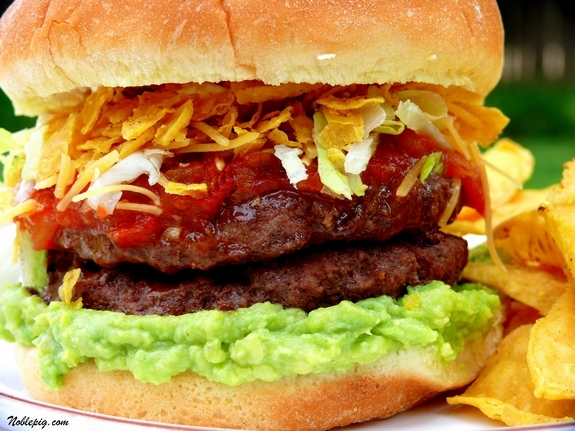 Place grilled burgers on top of the guacamole and top with salsa, lettuce, cheddar, sour cream and tortilla chips. That looks delicious and I think the combination sounds yummy! VERY YUMMY!!!! I’m going to have to try this out once we finally move the rest of our stuff over from Maine…which includes the grill! Wow. Now that looks delicious! Wow. That burger stands tall! Looks delicious. I think I would like it also. The avocado seems to be a very unique twist and will add plenty of flavor to the already flavorful meat pattie! Thanks. I will try this one soon. Guacamole on a burger? Now you’re talkin’! A taco burger is just genius! Did you ever put potato chips on your sandwich as a kid? The nachos totally remind me of that! Brilliant! I’d go for this much more than the baloney with mustard, lettuce, tomato and potato chips my friend and I used to eat in junior high. Excellent idea! This will definitely be a hit here at our house. I also used to eat potato chip or Frito sandwiches as a kid, so this does strike a chord with me too. Another gorgeous, finger-licking delicacy. This looks awesome! The picture is mouth watering, thanks! I think you’ve raised your son right and he has tremendously good taste and an eye for the scrummy! I’ve made a burger sort of like this but never thought to add the chips. Grand idea! The guacamole looks so delicious and your photos are gorgeous as usual! This looks like a seriously good burger. I have just found your blog and have spent some time here. Your vineyard is wonderful and so is your food. Have mercy! I could eat that for breakfast! That burger looks really good, Cathy. Love the avacado on it! I love Food Network magazine-and I really love the looks of that burger….that is some serious eating right there, for sure. Wow, who wouldn’t love this! Great idea to pile some chips on there too. that looks so freakin good. Unfortunately i am severely allergic to avocados. quite possibly the worst food allergy ever. I love this idea Cathy. It fits right in with my Tex-Mex cravings lately. This looks so good! I can totally relate to your son’s strange cravings! I get that way too with all the lovely fresh air and garden work! Looks so wonderful and messy. Where’s my taco burger eating shirt? This looks fabulous and I will certainly be trying it out! I think my daughter will love it as well! Hello crunchy chips on a burger. I’m there! Love the idea! I even made this and used fried flour tortillas as the “bun” – so good. Thanks for sharing! Oh yeah! Not only would my 16 year old son love one of these, but this would be worth the calories for me too! I have a feeling that I’ll be making these soon! We make your White Castle Burger recipe all the time! I was totally thinking this would be a good one for my Culinary Covers blog. I should have had you do it for me!! Looks like a good one for a family-friendly meal. I’m all about guacamole so it looks good to me too! What a great spin on a burger. My family will love this. Whoaaaa, that looks awesome! 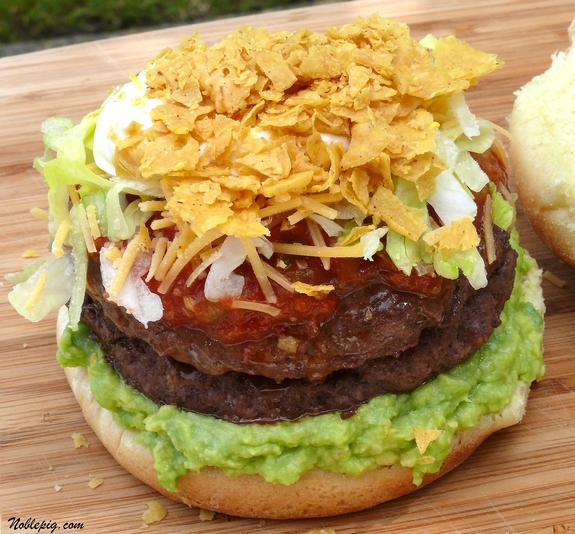 I love the guacamole layer, and those chips would add a fun surprise crunch. This one’s a keeper! YUM! We just made this burger this evening, we used avocado slices, instead of doing a guacamole, but we followed everything else, and it turned out fantastic! I definitely will be making this again!